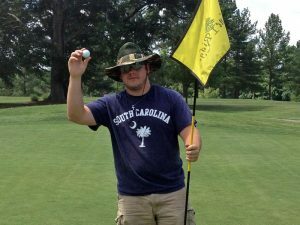 Cullen Rhoden, former all-state football player for the Strom Thurmond Rebels, makes a hole-in-one on the 16th hole at Pine Ridge Club. He hit a 7 iron 162 yards, landed just short of the green, and went in the cup. Possibly the only person to make a hole-in-one wearing camouflage Crocs, and a camouflage bucket hat. Witnesses: Thomas “Tank” Coleman, Reed Covar, Rucker Gibson, Garrett Gibson, and Jonathan McCreery.